Feel like a treat, or just some ‘me’ time to relax and really unwind? Then check out our beautiful spa facilities. We’ve got the ideal areas to help you really relax – from our indoor and outdoor whirlpools, to the steam room, and two different saunas – you’re bound to love spending time here. And, our two heated beds are the perfect place to sit back and give your tired muscles a break – the only thing you’ll need to do is try and stay awake! Your children's swimming skills will come on leaps and bounds here at David Lloyd Antwerpen, thanks to our brilliant Swimming programme and fantastic coaches. You can enrol your kids on the programme, where they'll learn all the essential swimming skills and techniques. Not only will they love learning in a fun environment, and talented coaches, but they'll get to know other David Lloyd Club children at the same time. 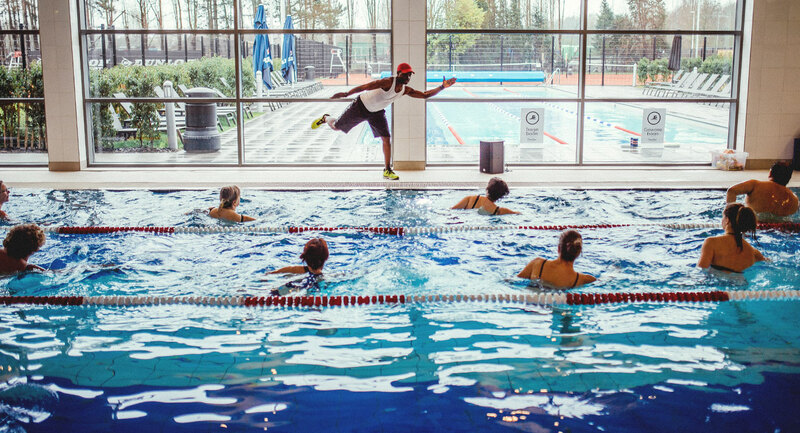 Swimming really is a great way to exercise, and our indoor and outdoor pools mean you can swim all year round, whatever the weather. Our outdoor pool is open throughout the year and is heated to make sure your swim out in the open air is lovely and enjoyable. And, it’s not just about lengths! Our Swim Fit group exercise class is a really fun way to exercise in the water – give it a go, it’s great for toning up.